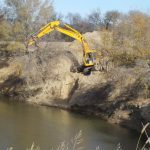 Streambank erosion in Kansas is a serious concern, particularly upstream of reservoirs. In just one year, normal changes in rainfall or storm events lead to tons of soil from streambanks washing away into the water, headed downstream. That same sediment, when unchecked, also can diminish reservoir capacity, degrade wetland areas, and create problems with municipal water systems. With approval from the Corps of Engineers and funding from both the Kansas Department of Health and Environment (KDHE) and Watershed Restoration and Protections Strategies (WRAPS), watershed specialist Ron Graber and his team partnered with a select few landowners along the Smoky Hill River interested in trying an untried method of streambank stabilization. This experiment is called a “woody revetment,” and, if successful, could save landowners tens of thousands of dollars – more, if there are several unstable streambanks on a property. Kari Bigham was a typical Kansas farm kid: like any adventurous youngster, she spent her time fishing, fossil hunting, building forts, and exploring the banks of the creek on her parents’ farm just west of Marysville. 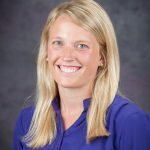 When she thought about her future, Kari entertained ideas of becoming a park ranger or a meteorologist, but thanks to advice from her father and brother (a K-State civil engineering student at the time), Kari discovered she had an interest and aptitude for engineering. “As a senior in high school, I didn’t know what an engineer was. Coming from a railroad town, I thought an engineer was just a train conductor,” she said. Later on, she realized that choosing to be a water resources engineer actually combined her two original career paths. Like a meteorologist, her work develops and uses models to make predictions; but, instead of forecasting weather patterns, Kari predicts the environmental processes surrounding streams. Plus, like a park ranger, her work protects and promotes the environment – all while avoiding being “bound to a desk.” According to Kari, her job provides the best of both worlds.